Charter of the Organization | "International Fund Apsny"
1.1 The Public Organization “International Fund Apsny” (hereinafter referred to as-“Organization”) established in accordance with the Constitution of the Republic of Abkhazia, civil code of the Republic of Abkhazia and law of the Republic of Abkhazia “On public associations, political parties and movements” and other legislative acts of the Republic of Abkhazia. 1.2 The official languages of the Fund are: Abkhazian and Russian. 1.3 The official name of the Organization in Abkhaz: Ауаажәларратә еиҿкаара « Жәларбжьаратәи Афонд Аҧсны ». 1.4 Short name of the Organization: АЕ «АЖәА». 1.5 The official name of the Organization in Russian: общественная организация «Международный Фонд Апсны». 1.6 Short name of the Organization: ОО «МФА». 1.7 The names общественная организация «Международный Фонд Апсны», ОО «МФА» and ауаажәларратә еиҿкаара «Аҧсны Жәларбжьаратәи Афонд», АЕ «АЖәА» are equal. 1.8 The location of the organization: Sukhum, 16, Pushkin St.
1.9 The organization has a membership, is socially oriented, non-governmental, established by citizens on the basis of voluntary property contributions, pursuing social, charitable and other socially useful goals. The property transferred to the Organization by its founders is the property of the Organization. 1.10 The organization carries out its activities on the territory of the Republic of Abkhazia and other States independently or through established representative offices and branches. Branches and representative offices shall act on behalf of the Organization in accordance with regulations approved by the Board of the Organization. 1.11 The organization is a legal entity and does not have as a goal of its activity deriving a profit for distribution among the founders and employees of the Organization as their income. In the case of income as a result of the Organization's activities it should be directed to the implementation of charter purposes. 1.12 The organization is the owner of its property, including the property transferred by its members and other persons. Property, transferred to the Organization is used for the purposes specified in its Charter. The organization has the right to be engaged in entrepreneurial activities required to achieve socially useful purposes for which the organization was created, and respective to these goals. The Organization has the right to create business companies or participate in them with the purpose of business activities implementation. 1.13 The organization acquires right of a legal entity from the moment of state registration. The organization has the right to have its own balance, round seal with its name, corner stamp, settlement, currency and other accounts in banking institutions of the Republic of Abkhazia and abroad, as well as other account information, and operates on the principles of full economic independence, strict compliance with current legislation. 1.14 The organization determines the direction of its activities, the strategy of economic and social development. The organization has the right to acquire property and personal non-property rights and obligations, enter into agreements, contracts, and agreements, sue and be sued in court, arbitration and other courts. 1.15 The organization is responsible for its obligations with the property, which may be levied upon law. 1.16 The organization is not liable for the obligations of the state and its organs. The state and its bodies are not liable for the obligations of the Organization. 1.17 The organization is not liable for obligations of the founders. The founders are not liable for the obligations of the Organization. 2. GOALS, ACTIVITY STATUS AND OBLIGATIONS OF THE ORGANIZATION. 2.1. The main goal of the Organization is to promote the recognition and strengthening of independence status of the Republic of Abkhazia abroad; consolidation of Abkhaz people in order to build a sustainable social and economic stability of a State, based on principles of democracy; to establish, develop and maintain relationships of Abkhaz diaspora all over the world with their compatriots in the Republic of Abkhazia. - Creating favorable conditions for participation of representatives of the Abkhaz diaspora in the socio-economic life of Abkhazia. 3.1. Membership in the Organization shall be voluntary and can be individual and collective. 3.3. Collective members of the Organization can be labor collectives of enterprises, organizations, institutions, associations of citizens who share the aims and objectives of the Organization, recognizing the Charter and participating in its activities. Collective members take part in the work of the Organization through representatives delegated by them. 3.4. Admission to the organization of individual and collective members is carried out by the Organization Board based on the applications of individual Members, decisions of labor collectives or governing body, decisions of labor collectives or the governing body of a non-profit organization for collective members. 3.5. Registration of the Organization members is carried out by the Board of the Organization. • voluntarily withdraw from the Organization by written notice to the Board. • provide material and other support to the activities of the Organization. 3.8. Membership in the Organization may be terminated by decision of the Board of the Organization, if the Member does not comply with the provisions of the current Charter, does not participate in the activities of the Organization, or their actions, cause damage to the Organization. The organization is not liable for the obligations of its members, as well as members of the Organization are not liable for the obligations of the Organization. 3.9. Members shall not retain rights to the property transferred to them and funds, including entrance and membership fees. 4.THE GOVERNING BODIES OF THE ORGANIZATION. 4.2. General meetings shall be convened by the board at least once a year. 4.3. The issues discussed at the General Meeting shall be resolved by a majority of votes. The General Meeting is competent to make decisions if attended by at least 2/3 of the members of the Organization. The general meeting is authorized to take decisions on any matter of Organization activities. Decisions may be taken both by an open or secret vote. Resolution on issues on the amendments to the Charter and the cessation of activities shall be adopted by 2/3 of votes present at the General Meeting. 4.5. In order to guide the activities of the Organization during the period between General Meetings and the implementation of General Meeting decisions the Board of the Organization shall be elected. 4.6. Organization Board shall consist of at least 11 members who are elected at the meeting from among the members of the Organization for a period of 5 years, including the President of the Organization, and Vice-President elected from among the Board members. The board may be temporary based on the decision of the General Meeting of Members. 4.7. President and Vice-President of the Board are elected by members of the Board by a simple majority for a period of 5 years. Re-election of a member of the Organization to the position of the President of the Board is not allowed. An exception is the President of the Temporal Board, which can be re-elected to the position of President of the Board. 4.8. Meetings of the Board members are organized by the President of the Board at least once in 15 days. The Board is authorized to make decisions if there are 2/3 members are present at the meeting. Decisions are made through the open elections by simple majority vote. • determines the size and order of membership, admission fees. • gives instructions and issue directives, orders within the limits of power. 5. 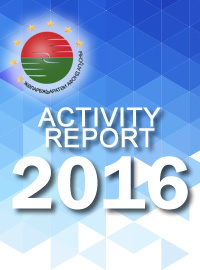 FINANCIAL AND BUSINESS ACTIVITIES OF THE ORGANIZATION. • carry out any other activities not prohibited by applicable law and aimed at achieving the chamber objectives of the Organization. 5.2. The organization is not intended to profit and redistribute profits from their activities to their members, and the procedures are directed to the decision of the authorized purposes and objectives of the Organization. 6. PROPERTY AND MEANS OF THE ORGANIZATION. 6.1. The organization operates from its own funds. • other receipts not prohibited by applicable law. 6.3. Organization in the manner prescribed by law may have a material provision for charter activity in the property basic funds, cash assets and other securities and property necessary for material support of the activities of the Organization, under the present Charter. The property of the Organization may be enterprises, organizations, created in accordance with the charter purposes and objectives of the Organization. 6.4. The Organization has the write to own agencies, publishers, and media, created or acquired at the expense of the Organization in accordance with its charter objectives. 6.5. The organization has the right to dispose its property and assets. Funds of the Organization are being expended by estimates, approved by the Board of the Organization. 6.6. The ongoing work of the Organization and content of regular staff of the Organization are provided at the expense of its own activities, enterprises contributions, organizations and citizens, as well as other donations, aimed at development and implementation of the charter activities of the Organization. 6.7. The organization has the right to form funds of social development and improve the social protection of the regular staff of the Organization by its own means. 6.8. The organization does not aim at profit making. Income from business activities of the Organization is directed at achieving the charter objectives and may not be distributed among members of the Organization. 6.9. The Organization Members shall have no property rights on the part of the property belonging to the Organization. 7.1. Termination of the Organization is carried out by means of reorganization (amalgamation , incorporation, separation, transformation) or liquidation. 7.2. The reorganization is carried out by decision of the General Meeting by a qualified majority (75%) of the votes. • the procedure stipulated by the current legislation. 7.4. Liquidation of the Organization is carried out by the liquidation committee, elected at the General Meeting. 7.5. The property and funds of the Organization, liquidated by a decision of the General Meeting, after settlement with the budget and creditors are directed to the targets contained in the Charter of the Organization. 7.6. The decision on liquidation of the Organization is sent to the registration authority.